This Philly pediatrician always prescribes reading to patients and parents. Here’s why. Hera Mahmood gives Aubrey Brown, 4, a book. On an early Tuesday morning, my first patient of the day is a month-old boy. He is healthy. But he is from Fairhill, an especially impoverished corner of the poorest big city in America. So, statistically, his life will be an average of two decades shorter than that of a child who lives a few miles south, in Philadelphia’s Society Hill neighborhood. Before entering the room with the customary tablet computer, stethoscope and a friendly expression on my face, I grab one more essential: a brightly colored board book, titled Baby ABCs. So, what can a book — or even a library of books — do to level the longevity field for children like my patient? In 1900, the average life expectancy for a man born in the U.S. was 48 years; women did slightly better at 51 years. Extraordinary public advances since then — vaccines; clean water and sanitation; antibiotics; birth control, and safer childbirth — as well as medical innovations such as cancer treatments and organ transplantation, have improved average overall life expectancy to nearly 79 years. Yet progress has stagnated and even declined due to the opioid epidemic and other “diseases of despair,” such as alcohol and substance abuse, and suicide. Less discussed, but no less important, is a lack of investments in alleviating child poverty and stress that have a profound impact on the developing brains and bodies of children, especially in the first five years of life. Since 1989, the Reach Out and Read (www.reachoutandread.org) national program has helped caregivers create language-rich environments for young children, to promote early brain development. 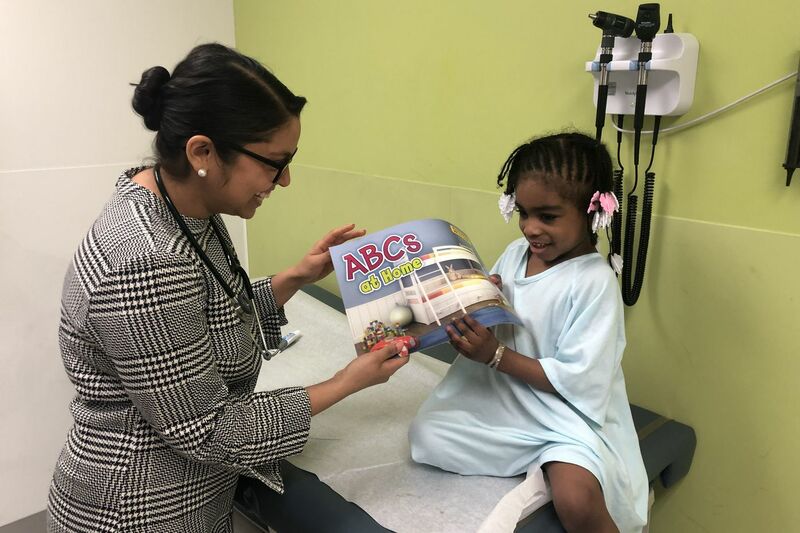 Research on Reach Out and Read shows that when pediatricians promote literacy readiness, there is a substantial effect on parental behavior and attitudes toward reading aloud, as well as improvements in the language scores of young children who participate. Participants in the program were 2.5 times more likely to read to their children and even more likely to come in for their well-visit checkups. One of the greatest predictors of high school graduation is third-grade reading levels — which, in turn, can largely be predicted by the vocabulary of a child at age 3. And that depends on a literacy rich, stimulating environment that includes daily reading from birth. Reach Out and Read is among many interventions that work on decreasing education inequality, but it’s one of the few that starts soon after birth. Every so often, a flatbed full of boxes is wheeled to the back of our practice, which takes care of more than 20,000 children. Half the cart holds lifesaving vaccines against flu, measles, mumps and rubella, which our nurses inventory and refrigerate right away. On the other side of the cart are cartons of books such as Goodnight Moon and If You Give a Mouse a Cookie. I inventory and store the books on shelves so my colleagues are sure to find just the right one for the families we serve. In their own way, these books are vaccines against educational disparities. As our nurse records the last vaccine, and I shelve the last book, we smile at each other and the empty boxes at our feet, collaborators in the long-term health of our patients. Editor’s note: This article previously stated that Reach Out and Read was founded in 1991, not 1989.